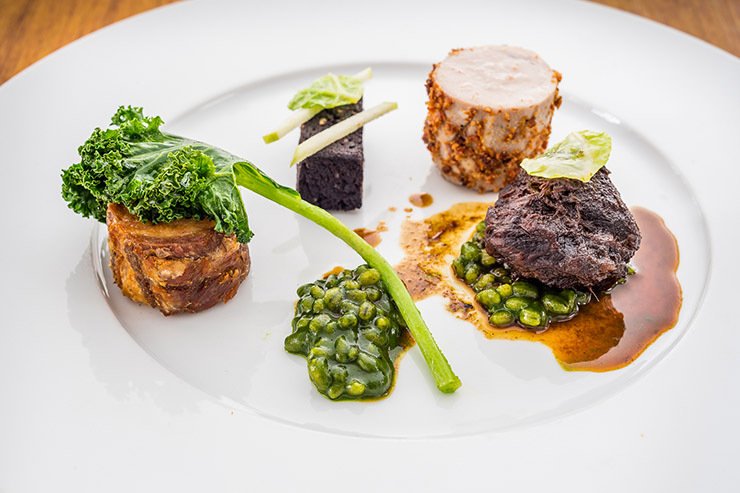 If, here at Source Towers, we aplhabetised our favourite Brighton restaurants, the S section would be bloated like an overfed restaurant critic. Semolina, Silo, The Set, 64 Degrees (sort of an S) would all be there. And of course… The Salt Room. The sizeable seafront seafood establishment, known for its sleek monochrome interiors and a crustacean collection rivalled only by The Sea Life Centre, has just cast out its autumn/winter menu, and we were stoked to be among the first to try it. A handful of the old favourites are still available — you can still pig out on the Surfboard To Share (shellfish grilled over fire), for instance. But the majority of the starters and mains are new. 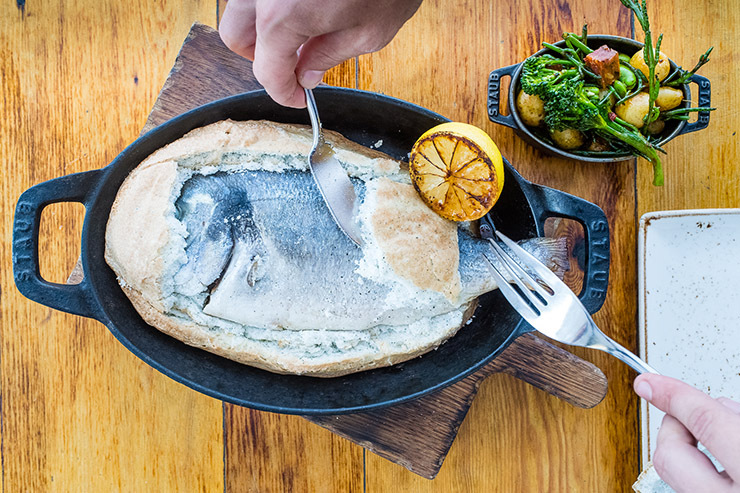 The Salt Baked Bream (pictured above), for example, looks to be a crowd-pleaser, and we spotted quite a few punters digging into its crusty, saline sarcophagus. 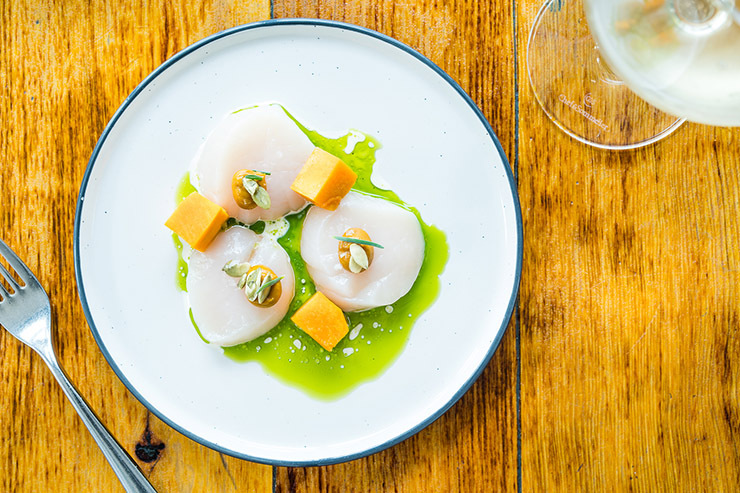 The Scallops with pumpkin, bacon cream and yuzu (pictured above) are also easy on the eye, while if any of your party is seafood averse… Tamworth Pork Belly with apple, cabbage and parsley (also pictured in the gallery) provides a meaty option. One new section that particularly excites us is the Ceviches (raw fish cured in citrus juices) — the tuna one even provokes a little dance when we taste it. Sharp (just the right side of tart) tuna arrives with oyster, ponzu and a punchy ‘bonito’ vinaigrette, all set against a flamboyant pink beetroot background. A highlight, both visually and sensually. Salt Cod Fritters, with cod roe and squid ink, are another intriguing appetiser. Satisfyingly savoury, they’d pair well with one of the volcanic wines, although we reckon they could handle some citrus sharpness to complement the salt. Alas, we don’t go volcanic with the wine, opting instead for the reliable (and reliably affordable) seafood staple — a refreshing Muscadet Sur Lie. 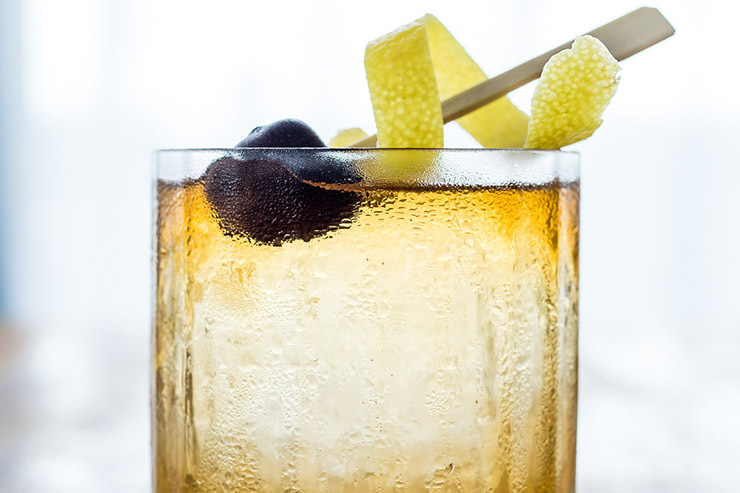 It’s decent, but it’s the Roots and Rye cocktail (pictured below) that really gets our juices gushing. Rye whisky (Jack Daniel’s they almost apologetically tell us when pressed — not that we mind), Cognac, lemongrass, bitters, and… home made chocolate with crystallised ginger on a stick. The citrus lick and feisty ginger don’t mess about here: it’s a winner. We aren’t allowed to leave without trying the crown jewels of the new dessert menu. Taste Of The Pier is a contemporary reimagining of your childhood’s guilty seaside pleasures — a Willy Wonka riff on the Palace Pier. A jammy hibiscus doughnut explodes when pierced, like Dracula’s heart with a stake driven through it, while a fuzzy plume of candy floss (yes, The Salt Room kitchen has acquired a candy floss machine) towers over the platter like the i360 shrouded in clouds. There’s also an orange meringue ‘99’ ice cream and a creamy chocolate pebble — but thankfully no rock. That would’ve been a sugar rush too far. As we glimpse out over the Friday-night Palace Pier lightshow, we decide the only omission here is a candy full English breakfast with gelatine sausages and gummy egg. Maybe they serve that for Sunday brunch… but hopefully not. The Salt Room, 106 King’s Road, Brighton BN1 2FU.